Welcome to this week’s Criminal Thoughts, with my learned colleague Vic Linde and myself. This week’s episode, ‘The Itch’, was written Breen Frazier and Larry Teng. Here are some thoughts about it. Alasdair: Vic, what did you think of this episode’s addressing of conspiracy culture and the ongoing discussion the show has with the popular perception of the FBI? Vic: I admire the way in which the writers are able to show the negatives of the characters’ jobs without making us dislike them. JJ and Kate pushing to get information was uncomfortable (and yes, rather stagey) but in character and didn’t cross the line. Lisa Randall was the most interesting to me in the episode. Her subtlety was much more effective than the loud and blunt approach taken with some of the other characters. Reid seemed to me to be the centre of the team this week, his careful delineation between diseases and his attitude towards all of the players in the game pulled everyone together. Also, I don’t remember Reid ever making the call to give the profile before – I liked it! Alasdair: Worked really didn’t it? And yes, Alicia Coppola as Lisa Randall was brilliant. She’s one of those actresses who’s turned up everywhere for years, never quite had a breakout role but has always been the best thing in any given episode of whatever she was in. Really nice to see her doing typically good work here. And I agree, there was a lot of really good Profiler Jedi stuff this week. I loved the not quite confrontation between Hotch and Lisa and how effortlessly, and kindly, he stepped around every single one of her defences. None of them are bad people, but all of them sometimes have to do bad things to get the job done and the show’s got very good at showing us that. Vic: Yup – it’s great when you see a guest star and you know it’s going to be good. She’s someone who always really shows up to work. 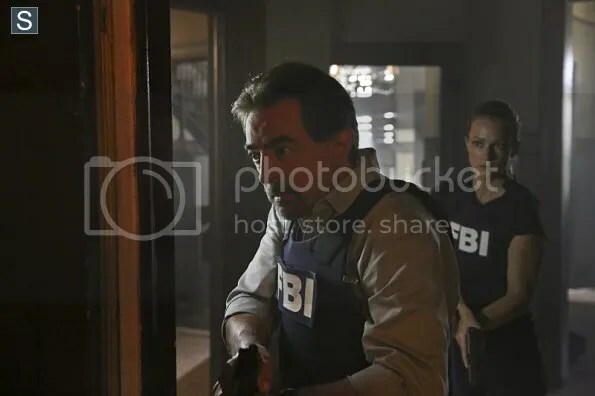 One of the things I have always enjoyed with Criminal Minds is that when you see a well-known guest you’re still not sure if they are going to be a victim, suspect, un-sub or witness. Keeps us all on our toes! The downside to showing the bad things that the profilers need to do, is that we still have to stick with them week by week so the people that they are up against can seem very cliched and I felt that a bit with this week’s episode. The un-sub was a little flat, although the saving part of it was Leo’s relationship with Jane, the scene in the diner and her apartment made it much neater. Alasdair: Absolutely! There’s a thing this season in particular seems to be doing where it continually takes a story to a resolution point and then…keeps going. I loved the relationship between Leo and Jane and the paranoid little world they built for themselves. It worked as a neat contrast with Lisa and also showed the weirdly attractive side of what they were doing. I also loved the snap back to reality when we saw what Lisa banging on the door sounded like to Leo. There was a hint of some Badlands-style spree killing there and whilst I’m glad they didn’t go down that route, I loved that the episode poised on the brink of the situation getting much much worse. Vic: They are doing a lot of leading this season, letting the viewers see where a story could go if the team wasn’t there, which is really great to watch. Vic: This episode felt a lot more linear, with few mis-directs and only one un-sub for the show to focus on. Did you think the simplicity worked for the story? Alasdair: Absolutely. It’s always interesting seeing a show head out into the rarified territory past the magical 7th season. Some are content to just endlessly recycle old plots, others fire spores out into the TV system to ensure they live for ever. As an aside; NCIS is 12 years old, is itself a spin off, has two active spin offs and one failed one. And CSI is about to launch another spin off having outlived it’s previous two!. But Criminal Minds does something a lot more fun and simpler. It’s got a formula and some of the most well rounded and best loved characters in this sort of TV. So it’s having a little fun. Stories are getting stripped back, ideas are being played with and it’s really working. It’s almost like the mechanisms of the show are mirroring the training of the BAU. They’re professional. They’ve got this under control. Vic: The only downside that I can see is that it feels a little like we’ve drifted from our original gang of crimefighters. I normally really dislike the ‘let’s focus on one character to make them seem real’ episodes but right now I’d like an episode that really looked at JJ, Hotch, Rossi or Morgan. It seems like we’ve not touched base with them lately. Alasdair: I agree, but I also think we’re starting to see that addressed a little. I wonder if this season was designed to have a few done-in-ones at the start so Callahan can settle in. Of course, Callahan hasn’t needed a lot of settling in (Again, JLH was tremendously good fun this episode) but it makes sense to structure the season that way. Plus they’ve sort of toyed with personal episodes with the Garcia vs the Death Penalty plot. But yeah, I agree. It’ll be nice to get back to some people focused episodes. Also, the line for the Kevin solo episode starts here. Vic: And they are putting Kate with each of the members of the team to make sure the chemistry and balance between them is shown. Kate and Morgan in the next episode hopefully! Always more Kevin. The amount of affection for each and every one of the characters is a real testament to how well the show is crafted. Ten seasons in and none of them are dry, and they have managed it without continuously patching the backstory. Although I watched a fair bit of this episode with my hands in front of my eyes (oh god, the roaches!) it was well-paced, if a little weaker than last week’s awesome episode.